I love cinnamon candies. I like putting them in my applesauce and I like putting them on top of my homemade frosted sugar cookies. They are so darned good! So, when I recently stumbled onto a cookie recipe at Bakingdom that called for cinnamon candies, in and on the cookie, I knew that the cookie and I were destined for each other. I made some modifications to the original (shortbread) cookie recipe by trying to be conscientious of that fact that the recipe called for two sticks of butter or margarine. I cut the fat down to one stick, and as a result of doing so, my adapted version of the cookie is lacking in the soft and tender department. In fact, my first bite was like oh, no… But with that said they have grown on me and I’ve eaten my fair share, and then some! Being a soft cookie fan just means I just had to change my mindset. Line two cookie sheets with parchment paper. Preheat oven to 300 degrees. In a mixing bowl, beat margarine, sugar, salt, and vanilla until mixture clumps together. Mix in candies and flour; mix thoroughly. Place a piece of parchment paper on a flat surface and roll dough out to about 1/4” thick. Using a cookie cutter cut cookies out. I made designs on top of my cookies with a smaller cookie cutter – similar to what Darla from Bakingdom did. Continue to re-roll excess dough and repeat. Place cookies on prepared cookie sheets and bake for about 12-14 minutes. Remove from oven and cool. In a separate bowl, add 1 1/4 c. confectioners sugar, 1 tbsp. softened margarine, a drop of milk, and 1/2 tsp. vanilla extract. Mix icing until it’s thin and can be drizzled on top of cookie. Add another drop of milk if necessary. 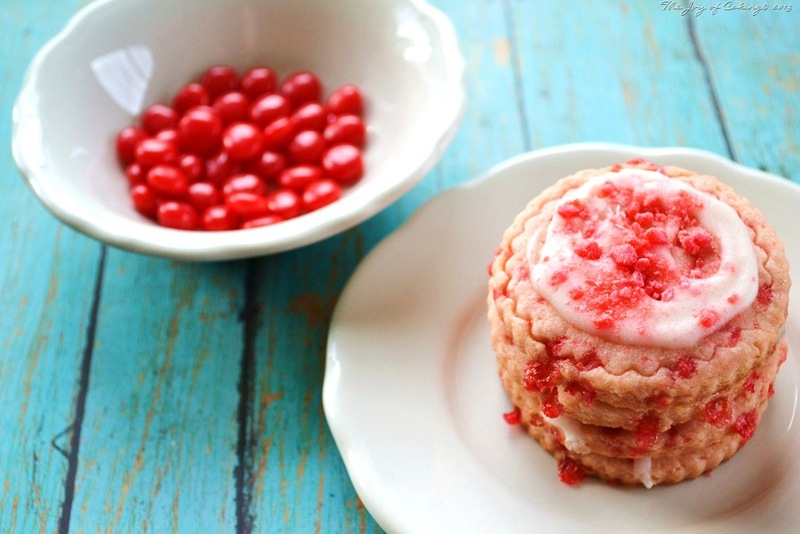 Drizzle icing on cooled cookies and sprinkle with crushed candies. Are you planning on making cookies to share with friends and family this holiday season? If so, what is the one cookie you must to make? 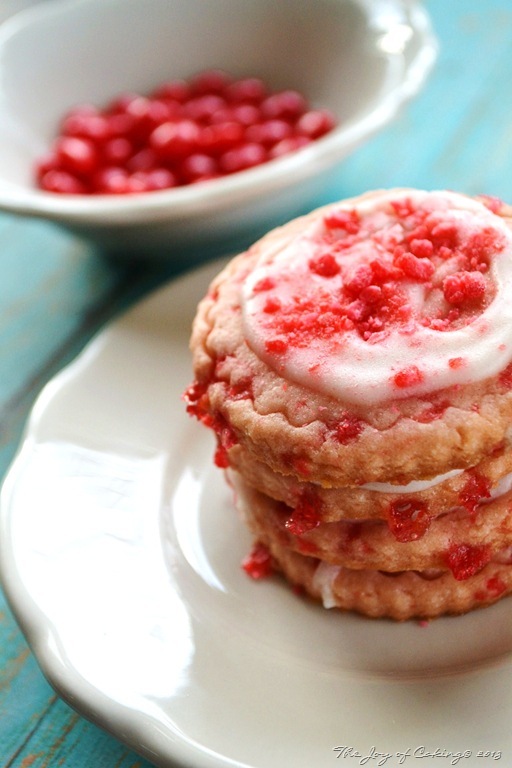 I love cinnamon candies, too, so yup, gotta pin these beauties! As soon as I saw this, I said, “Wow!” I’ve got to make these! LOL… Warning – they don’t last long! This one is moving to the top of the list. These cookies are so pretty! What a great recipe for Christmas, or Valentine’s day. I sent a link of my post to the candy manufacturer and they sent me a rude email back. Due to that email, I have removed the name of the candy company and the name of the candy from my blog post. What the??? I would think they’d be delighted that you were promoting their candy! Awww….now I don’t want to like them anymore! But your cookies are still so scrumptious! I don’t think I’ve eaten Red Hots in decades! They were a childhood favorite. 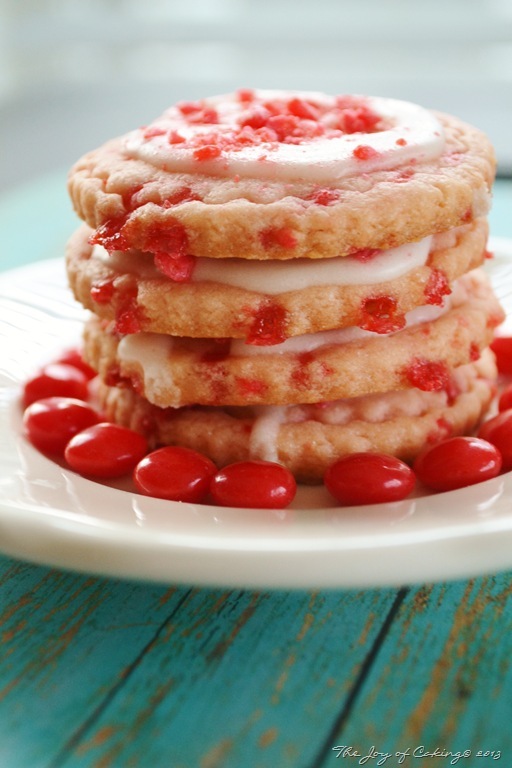 Your cookies are so pretty…love how you used a second cookie cutter!